Caution & Warning Labels at Affordable Alternatives, Inc. These labels come in various sizes, since they may not be to scale, please note the size in the text. They also vary in label counts per roll. Please note the count on each product that you order. Typically, the larger the label, the smaller the label count. Limit damage to assets by improper return procedures. 1.2" x .9" size. CAUTION! SELF CHECK labels .88"x1.84",ylw/red/blk 375/roll. Please affix these "CAUTION SELF CHECK" warning labels on all media to protect recorded library media from magnetic self-check systems & other magnetic fields. These bright yellow, red & black print labels are 1" wide by 2" tall & are packed 750/roll, four rolls/sleeve. & 32 rolls/case. Until all of the 515 size are gone, we will ship two rolls of tghe 515 size for each 2010 size ordered. CAUTION The library is NOT RESPONSIBLE label roll(s) 2x1" wh/red, 750/ roll. <--> Click on image to enlarge. 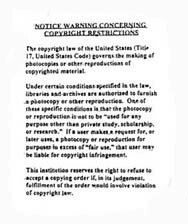 White/Black 8.5" x 11" wall signs for areas where one might be tempted to make illegal copies of copyright protected material. 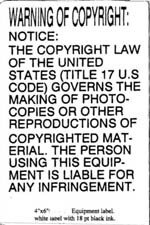 Copyright label roll(s) 4"x 2" 100/rl. <--> Click on image to enlarge. 100 pack of 4"x2" white/black labels for copyright protected media. Copyright label roll(s) 4"x2" 380/rl. <--> Click on image to enlarge. Black/White media 4"x2" labels Jumbo 380 count pack for actual copyright media that one might be tempted to copy. Copyright warning labels. 4"x6" wh/blk. 10 pack. <--> Click on image to enlarge. White/black 4"x6" labels for placement on any equipment that could be used to violate copyright laws. 10 per pack. This 1.46" by 1.375" fluorescent chartreuse label with black print & red images warns all to avoid exposure to any magnetic fields. It should be applied to all magnetic media in the library. 500 per roll. DO NOT SENSITIZE Label Roll(s) .75"x1.38" flg/blk. DO NOT SENSITIZE Label Roll(s) .75"x1.38" Protect magnetic media from damage. 800 per roll. Small enough for DVDs & MP3s, yet bold enough for a book. 1000 labels .75" wide by .5" tall per roll. FBI WARNING label roll(s) 2010 for violation of copyright laws 750/roll. <--> Click on image to enlarge. This white, black, & red 2" x 1" label details the penalties & basic elements of violations, fines, etc. for copyrighted films, videos, & discs, etc. We replaced the 500 count FBI label with the 750 labels-roll to save you money. 750 labels is 50% more than previous FBI label. FOR HOME USE ONLY label roll(s) 1" x 5/8"
This smaller size Blue & Black label is a better value and is used in conjunction with copyright, Public Performance Rights, FBI labels etc. 1" x .625" 1000 per roll. We no longer offer this size as a stock label. Please order the 1" x 5/8" label for this caution label. If you still want the larger label we will offer it by the case of 24M (24,000) only with 4 week lead time. These 3/4" tall by 1 3/8" white & green labels give notice that the material labeled may require some parental scrutiny before allowing minors to read it. 800 per roll. No Technical Service label roll(s) 1.2"x1.9"
This bright fluorescent chartreuse, red, & black label on the asset tells the patron that he/she must seek technical assistance & help elsewhere for the software or other item borrowed from the library. This fluorescent red & black 3/4" tall by 1 3/8" wide label comes 800 per roll & urges patrons to rewind cassettes before returning them. This fluorescent pink & black 7/8" wide by 1/2" tall GP adhesive label promotes patron rewinding of certain assets prior to their return to the library. 1200 per roll. 375 labels per roll. Large 1 3/4" x 1 7/8" label. What do you do with a problem tape? Please notice our more efficient smaller Problems? label will work with all media. Request patron reporting of problems with borrowed assets. 1000 labels per roll. 1" wide by 5/8" tall. Public Performance Rights label roll(s) 7/8" x 1/2"
Keep track of the levels of usage secured with your purchase & allowed under copyright law for various assets & mark them accordingly. 1200 labels per roll. READERS ADVISORY labels lilac & purple 7/8" wide by 1/2" tall. 1200 per roll. SEND TO T.S. ON RETURN label roll(s) .75x1.38"
3/4" tall by 1 3/8" wide fl red & black label, 800 per roll. Indicate items that need attention when returned. These .625" tall by 1" white & green labels give notice that the material labeled may require some parental scrutiny before allowing minors to read it. 1000 per roll. UNSUITABLE for YOUNG PEOPLE label roll(s) 1"x 5/8" white green subtle msg. These .625" tall by 1" white & green labels give subtle notice that the material labeled may require some parental scrutiny before allowing minors to read it. 1000 per roll. Silver Tamper-proof foil & Black print Leaves VOID message when removed. Protect VHS tapes. 250 labels per roll. "Warning! Disk will not play if, exposed to heat dust or fingerprints. Handle carefully" label roll(s). Warns patrons of potential dangers to media. fl pink & black label is 1.46" x 1.375" & comes 500 per roll. WARNING! Label Roll(s) 518 $____ fee, if Instruction book is not returned. Makes patron aware of amount of fee for losing, or failing to return the instruction book. 1/75" x 1/875" size. 375 fluorescent pink & black per roll. <--> Click on image to enlarge. This is our largest stock label. It spells in detail what is prohibited & what is the cost of violating labeled media. FL Red/Black 250/roll each label is 1.45" x 2.875"
Warning to Patrons not to expose the labeled asset to the heat in a closed automobile or direct sunlight. There are 500 white & red .9" x 1.2" labels per roll. "WARNING! This video cassette will warp if left in car or direct sun" label roll(s). There are 375 labels/roll. They are yellow & red, 1 3/4" x 1 7/8" to remind patrons to protect library media from extreme heat & direct sunlight. WARRANTY VOID IF REMOVED label roll(s)1"x5/8"
1000 each 1" x 5/8" blue & black labels per roll. Warning of consequences for removal of this label. State the replacement up-front to deter squabbles over fines with these labels. WARNING! Lose or damage all or any part of this asset and you will pay the full retail price of the asset plus a $____ processing fee! 500 1.46" by 1.375" labels per roll. Warning! This will melt 3719 if left in car or direct sun label roll(s). Notice of peril to library asset due to exposure to heat. 800 labels per roll. fl green & black 3/4" tall bt 1 3/8" wide. "Warning-DVD will not play if, exposed to heat dust or fingerprints. Handle carefully" label roll(s). Warns patrons of potential dangers to media. fl pink & black label is 1.46" x 1.375" & comes 500 per roll. WARNING! Direct sunlight heat or magnets may harm this item. Replacement will be the patron's responsibility. New smaller size replaces old 513 size. 500 yellow & red 1.2" x .9" labels per roll. PLEASE DO NOT WRITE IN THIS BOOK White/Black 1.2" by 1.9" inches. 250/roll. 5 rolls/sleeve, Caution patrons about defacing the book. Price per roll of 250 labels. Please order in multiples of 5 rolls.